Specifically, I detailed what executive skills are valued at board level but also why evidencing prior governance experience is so important. Today I want to look at the third of the five elements: Your Networks & Personal Connections. I hope that, by the end of this article, you will understand the importance of emphasizing this aspect of your experience when applying for a board position. At the most basic level personal connections are simply people you know. If you are a frequent reader of my articles, then you would have read that these connections can be divided into ‘strong ties’ and ‘weak ties’, i.e. respectively those people you see frequently and those whom you see rarely/infrequently. It’s interesting to note that your strong ties are statistically less likely to land you a new job / board position and that, counter-intuitively, the weak ties are more likely to. Networks differ from personal connections really only in the approach you take to making them. ‘Networking’ conjures up the notion of handing out business cards at cocktail parties or work events and as such are shallow and get stale easily. Developing personal connections on the other hand suggests a less pressurised approach where you take interest in the individual and how you can help them. As such they are easier to maintain and intrinsically have more value. Why do Chairs care about your personal connections? Being well connected suggests that you are a strong candidate. I have rarely interviewed a candidate who has a wide range of industry connections who was not also a strong candidate. The fact that they were well connected was not the reason that they were a strong candidate. Instead, they were likely to be a strong candidate because they were well connected. The difference may seem minute on first reading but in an application scenario this difference is invaluable. You see, well connected individuals form genuine and meaningful connections over time because of the way they do business. Further, they are likely to form many of these sorts of relationships because they have been successful in their career. It is this sort of individual a Chair wants on their board. Your connections provide some comfort as to your ability to serve on their board. One of a Chair’s roles is to maintain their board’s ‘fragile ecosystem’ – an ecosystem that is potentially in jeopardy when any new appointment is made. For this reason, providing comfort that your appointment won’t adversely affect the workings of the board is critical. A good way to do this is to evidence your (relevant) personal connections (as opposed to your networks). In doing so you can show that, were you to be appointed, you would be culturally aligned with the other board members and the workings of the board. Of course, having strong executive or non executive industry experience can demonstrate this as well. However, if you do not have strong personal connections then you may just be deemed too much of a risk to be appointed. In short, evidencing relevant personal connections can go a long way to provide a Chair the comfort they need to appoint you. Your personal connections are likely to be called on during your tenure to address a wide range of strategic and operational board issues. It is no secret that a lot of executive decision making is done on the basis of personal recommendations or past experience. This is true at board level as well and is probably the reason most Chairs want well connected board members sitting on their boards. Having board members connected to a wide range of individuals that the Chair might not know but trusts or values, means that the board has access to different perspectives. These differing views add value to the board in terms of competitor knowledge or thought leadership – either of which might put them ahead of their competitors or lead the board to making more informed decisions that lead to the organisation delivering their services more effectively. Is it all about your personal connections? No. There have been times when I have interviewed ‘professional networkers’ who have a long list of ‘industry connections’. On first glance, these individuals seem impressive. However, on closer inspection, these individuals can easily be separated from candidates with genuine personal connections. Having done this, these candidates quickly fall to the bottom of the pile of those who would be appointed. So wheeling out a list of people you ‘know’ in an application or interview won’t work unless you have a credible story about the way you interact with them and how you can leverage them in the future. They do. However, they count only if they are genuine. If they are, then they suggest not only that you know a lot about your industry but that you are also likely to be well respected within that industry. Further, if you are well respected then you will bring that respect with you to the board that you join. 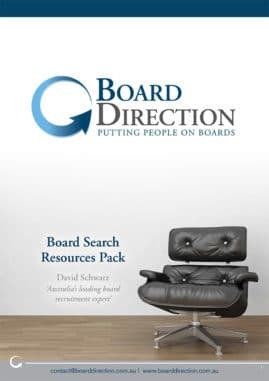 These are things that any Chair wants from a board member and as such should be something you should emphasise in your board applications. Wider connections than you have, which you can leverage. In the next article we will look at what else a Chair wants in new board members – specifically having an demonstrable passion for the business/industry.